Emilia-Romagna is one of the wealthiest and most developed regions in Europe, with the third highest GDP per capita in Italy. Bologna, its capital, has one of Italy's highest quality of life indices and advanced social services. Emilia-Romagna is also a cultural and tourist centre, being the home of the University of Bologna, the oldest university in the world, containing Romanesque and Renaissance cities (such as Modena, Parma and Ferrara), a former Eastern Roman Empire capital such as Ravenna, encompassing eleven UNESCO heritage sites, being a centre for food and automobile production (home of automotive companies such as Ferrari, Lamborghini, Maserati, Pagani, De Tomaso and Ducati) and having popular coastal resorts such as Cervia, Cesenatico, Rimini and Riccione. In 2018, the Lonely Planet guide named Emilia Romagna as the best place to see in Europe. Before the Romans took control of present-day Emilia-Romagna, it had been part of the Etruscan world and then that of the Gauls. During the first thousand years of Christianity trade flourished, as did culture and religion, thanks to the region's monasteries. Afterwards the University of Bologna—arguably the oldest university in Europe—and its bustling towns kept trade and intellectual life alive. Its unstable political history is exemplified in such figures as Matilda of Canossa and contending seigniories such as the Este of Ferrara, the Malatesta of Rimini, the Popes of Rome, the Farnese of Parma and Piacenza, and the Duchy of Modena and Reggio. In the 16th century, most of these were seized by the Papal States, but the territories of Parma, Piacenza, and Modena remained independent until Emilia-Romagna became part of the Italian kingdom between 1859 and 1861. After the referendum of 2006, seven municipalities of Montefeltro were detached from the Province of Pesaro and Urbino (Marche) to join that of Rimini on 15 August 2009. The municipalities are Casteldelci, Maiolo, Novafeltria, Pennabilli, San Leo, Sant'Agata Feltria and Talamello. The region of Emilia-Romagna consists of nine provinces and covers an area of 22,446 km² (8,666 sq. mi. ), ranking sixth in Italy. Nearly half of the region (48%) consists of plains while 27% is hilly and 25% mountainous. The region's section of the Apennines is marked by areas of flisch, badland erosion (calanques) and caves. The mountains stretch for more than 300 km (186.41 mi) from the north to the south-east, with only three peaks above 2,000 m – Monte Cimone (2,165 m), Monte Cusna (2,121 m) and Alpe di Succiso (2,017 m). The region has a temperate broadleaved and mixed forests and the vegetation may be divided into belts: the Common oak-European hornbeam belt (Padan plain and adriatic coast) which is now covered (apart from the Mesóla forest in Province of Ferrara) with fruit orchards and fields of wheat and sugar beet, the Pubescent oak-European hop-hornbeam belt on the lower slopes up to 900 m, the European beech-Silver fir belt between 1,000 and 1,500 m and the final mountain heath belt. 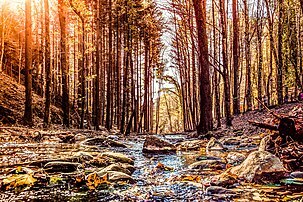 Emilia-Romagna has two Italian National Parks, the Foreste Casentinesi National Park and the Appennino Tosco-Emiliano National Park. Emilia-Romagna has been a highly populated area since ancient times. Inhabitants over the centuries have radically altered the landscape, building cities, reclaiming wetlands, and establishing large agricultural areas. All these transformations in past centuries changed the aspect of the region, converting large natural areas to cultivation, up until the 1960s. The trend then changed, and agricultural lands began giving way to residential and industrial areas. The increase of urban-industrial areas continued at very high rates until the end of the 2010s. In the same period, hilly and mountainous areas saw an increase in the registration of semi-natural areas, because of the abandonment of agricultural lands. Land use changes can have strong effects on ecological functions. Human interactions such as agriculture, forestation and deforestation affect soil function, e.g. food and other biomass production, storing, filtering and transformation, habitat and gene pool. In the Emilia-Romagna plain, which represents half of the region and where three quarters of the population of the region live, the agricultural land area has been reduced by 157 km2 while urban and industrial areas have increased to over 130 km2 between 2003 and 2008. 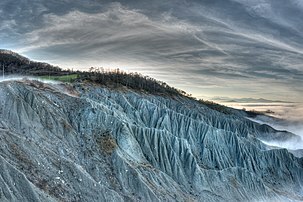 The impact of land use and particularly of the urbanisation of the Emilia-Romagna plain during this period has had some strong consequences in the economical and ecological assessment of the region. The loss of arable land is equivalent to a permanent loss of the capacity to feed 440,000 persons per year from resources grown within the region. The increased water runoff due to soil sealing requires adaptation measures for river and irrigation canals such as the building of retention basins, at a total cost estimated in the order of billions of euros. In 2000 there were 103,700 farm holdings and in 2010 there were 73,470, or a -29.2% loss in holdings for the region. The total utilised agricultural area (UAA) was 1,114,590 hectares (2,754,200 acres) in 2000 and 1,064,210 hectares (2,629,700 acres) in 2014 for a loss of 4.5%, indicating a downturn of smaller farm ownership. During this same timeframe there was a 14.5% decrease in the farm labor workforce. The Regional Government (Giunta Regionale) is presided by the President of the Region (Presidente della Regione), who is elected for a five-year term. The Regional Government is composed of the President and the Ministers (Assessori), of which there are currently twelve including the Vice President and the Under-Secretary for the President's office. 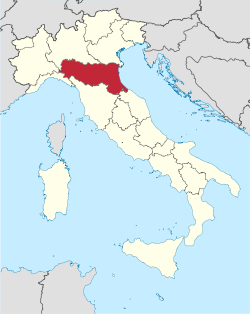 Apart from the province of Piacenza, Emilia-Romagna was historically a stronghold of the Italian Communist Party, forming the famous Italian "Red Quadrilateral" with Tuscany, Umbria and Marche. This is probably due to the strength of the anti-fascist resistance around the time of World War II as well as a strong tradition of anti-clericalism dating from the 19th century, when part of the region belonged to the Papal States. The strength of the anti-fascist resistance is one of the main factors, along with the effectiveness of trade-unionism, that led to the dominance of the PCI in the region. Emilia-Romagna has since World War II been a left-wing stronghold, nowadays led by the Democratic Party, since its creation in 2007. At the April 2006 elections, 60% of voters in Emilia-Romagna voted for Romano Prodi, while 40% did in 2013 (29% at national level). 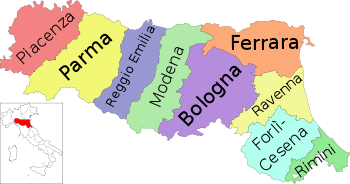 Emilia-Romagna is divided into nine provinces. Apart from the creation of the Metropolitan City of Bologna, plans to reduce the number of provinces from nine to four have been dropped. The population density, which was equal to 197 inhabitants per km² in 2010, is just below the national average. The population of this region is traditionally evenly distributed, with no dominant metropolis but rather a line of medium-sized cities along the Via Emilia, where the majority of regional industrial production is concentrated. The coast of Romagna is also densely populated due to the booming seaside tourism in recent decades. In the peripheral areas of the Apennine Mountains and the agricultural plains around Ferrara and Piacenza the population is less dense. Between 1876 and 1976, about 1.2 million people emigrated from Emilia-Romagna to other countries. As of 2008[update], there were 119,369 people from this region living outside Italy, particularly in Argentina, Switzerland, France, the United Kingdom and Brazil. As of 2008[update], the Italian National Institute of Statistics (ISTAT) estimated that 365,687 foreign-born immigrants lived in Emilia-Romagna, equal to 8.5% of the total regional population. Apart from Standard Italian, Emilian and Romagnolo, two closely related languages that are part of the Emiliano-Romagnolo language family, are the local languages of Emilia-Romagna. They are Romance languages spoken almost exclusively in the region and in San Marino. Sillaro river, near the town of Castel San Pietro Terme is the border between Emilia and Romagna. They belong to the Northern Italian group within Romance languages (like Piedmontese, Lombard, Ligurian and Venetian), which is included in the wider group of western Romance languages (including French, Occitan, Catalan, and Spanish). They are considered minority languages, structurally separated from Italian by the Ethnologue and by the Red Book of Endangered Languages of UNESCO. Emilia-Romagna today is considered one of the richest European regions and the third Italian region by GDP per capita. These results have been achieved by developing a very well balanced economy that comprises Italy's biggest agricultural sector as well as a long-standing tradition in automobile, motor and mechanics manufacturing and a strong banking and insurance industry. In spite of the depth and variety of industrial activities in the region, agriculture has not been eclipsed. Emilia-Romagna is among the leading regions in the country, with farming contributing 5.8% of the gross regional product. The agricultural sector has aimed for increased competitiveness by means of structural reorganisation and high-quality products, and this has led to the success of marketed brands. Cereals, potatoes, maize, tomatoes and onions are the most important products, along with fruit and grapes for the production of wine (of which the best known are Emilia's Lambrusco, Bologna's Pignoletto, Romagna's Sangiovese and white Albana). Cattle and hog breeding are also highly developed. Farm cooperatives have been working along these lines in recent years. With their long tradition in the region there are now about 8,100 cooperatives, generally in the agricultural sector and mainly located in the provinces of Bologna (2,160) and Forlì-Cesena (1,300). Industry in the region presents a varied and complex picture and is located along the Via Emilia. The food industry (e.g. Barilla Group) is particularly concentrated in Parma, Modena and Bologna as is the mechanical and automotive industry (e.g. Ferrari, Ducati, Lamborghini, De Tomaso, Maserati, Pagani, Sacmi). The ceramic sector is concentrated in Faenza and Sassuolo. Tourism is increasingly important, especially along the Adriatic coastline and the cities of art. The regional economy is more geared to export markets than other regions in the country: the main exports are from mechanical engineering (53%), the extraction of non-metallic minerals (13%) and the clothing industry (10%). The region of Emilia-Romagna has a very good system of transport, with 574 km of motorways, 1,053 km of railways and airports in Bologna, Forlì, Parma and Rimini. The main motorway crosses the region from north-west (Piacenza) to the south-east (Adriatic coast), connecting the main cities of Parma, Reggio Emilia, Modena, Bologna, and from here further to Ravenna, Rimini and the Adriatic coast. The unemployment rate stood at 6.5% in 2017 and was lower than the national average. Emilia-Romagna is the main setting for Bernardo Bertolucci's epic 1900. Rimini is the birthplace of Federico Fellini and Ferrara of Michelangelo Antonioni. Emilia-Romagna is considered one of the richest regions of Italy with regards to its gastronomic and wine-making tradition. The region is known for its egg and filled pasta made with soft wheat flour. Bologna is notable for pasta dishes like tortellini, lasagne, gramigna and tagliatelle which are found also in many other parts of the region in different declinations. The Romagna subregion is known as well for pasta dishes like garganelli, strozzapreti, sfoglia lorda and tortelli alla lastra. In the Emilia subregion, except Piacenza which is heavily influenced by the cuisines of Lombardy, rice is eaten to a lesser extent. Polenta, a maize-based dish, is common both in Emilia and Romagna. 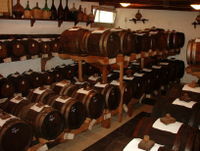 The celebrated balsamic vinegar is made only in the Emilian cities of Modena and Reggio Emilia, following legally binding traditional procedures. Parmigiano Reggiano (Parmesan Cheese) is produced in Reggio Emilia, Parma, Modena and Bologna and is much used in cooking, while Grana Padano variety is produced in the rest of the region. 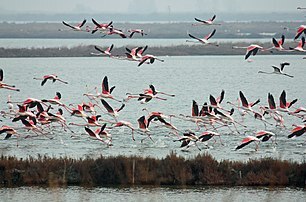 Although the Adriatic coast is a major fishing area (well known for its eels and clams), the region is more famous for its meat products, especially pork-based, that include: Parma's prosciutto, culatello and Felino salami, Piacenza's pancetta, coppa and salami, Bologna's mortadella and salame rosa, Modena's zampone, cotechino and cappello del prete and Ferrara's salama da sugo. Reggio Emilia is famous for its fresh egg-made pasta cappelletti (similar to Bologna's tortellini but differing in size), the typical erbazzone a spinach and Parmigiano Reggiano salted cake and its Gnocco Fritto some kind of mixed flour stripes fried in boiling oil, enjoyed in combination with ham or salami. Crescentina best known as tigella is the typical thin round bread that originates in the Apennines around Modena and it is usually filled in with the typical cunza (a spread made from pork lard and flavoured with garlic and rosemary) or with cold cuts, cheese and salty dressings or sweet spreads. Piacenza and Ferrara are also known for some dishes prepared with horse and donkey meat. In Romagna, near Adriatic coast, is famous a kind of round bread called "piadina". Regional desserts include zuppa inglese (custard-based dessert made with sponge cake and Alchermes liqueur) and panpepato (Christmas cake made with pepper, chocolate, spices, and almonds). An exhaustive list of the most important regional wines should include Sangiovese from Romagna, Lambrusco from Reggio Emilia or Modena, Cagnina di Romagna, Gutturnio and Trebbiano from Piacenza. Emilia-Romagna gave birth to one of the most important composers in the history of music, Giuseppe Verdi, as well as Arturo Toscanini, one of the most acclaimed conductors of the 20th century, and the world-famous operatic tenor Luciano Pavarotti. 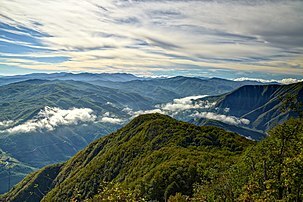 The region is well known in Italy for its popular rock and folk musicians, such as Laura Pausini, Samuele Bersani, Luciano Ligabue, Vasco Rossi and Zucchero. "Romagna mia", a song written in 1954 by Secondo Casadei, is considered by many as the unofficial anthem of Romagna. Ferrari's motor sport division Scuderia Ferrari is also run out of Maranello in the Province of Modena, the teams' colours being red. Ferrari's Formula One team has won 15 Drivers' titles and 16 Constructors' titles. The team has also won multiple Le Mans 24 Hours in sportscar racing. The most successful Ferrari driver is German racer Michael Schumacher won five consecutive Formula One titles between 2000 and 2004 with Ferrari, being the first Formula One driver to achieve that milestone. Among other legendary Ferrari drivers include pre-Formula One era Tazio Nuvolari, and in the Formula One era Alberto Ascari, Juan Manuel Fangio, John Surtees, Niki Lauda and Kimi Räikkönen include among drivers to have won the title in a Ferrari car. Ducati Corse is the motorsports division of Ducati's motorcycle company, being the predominant Italian constructor in MotoGP and the Superbike World Championship. Ducati has won one MotoGP title with Australian Casey Stoner in 2007. Stoner is also the most successful rider for the team in MotoGP, having won 23 Grands Prix in his four seasons. Ducati have had multiple World Champions Valentino Rossi and Jorge Lorenzo race for the team. In 2017, Emilia-Romagna native Andrea Dovizioso finished second in the MotoGP championship for Ducati. The team has frequently had at least one Italian rider in its factory team since its entry into the premier class in 2003 at the beginning of the four-stroke engine era. Its first Grand Prix winner was Emilia-Romagna native Loris Capirossi in the team's inaugural season. Ducati have also won multiple Superbike titles with riders such as Carl Fogarty and Troy Bayliss being among title winners. Aside from Dovizioso and Capirossi, high-profile road racers Marco Melandri and Marco Simoncelli also have come out of Emilia-Romagna. Simoncelli died in an accident when he was run over after a crash on track in Malaysia in 2011 at the age of 24, and was honoured by having the race circuit in Misano named after him. Emilia-Romagna have two major international race circuits; Autodromo Enzo e Dino Ferrari in Imola and the aforementioned circuit in Misano Adriatico. Imola used to host Formula One between 1980 and 2006, under the banner of San Marino Grand Prix on all but one occasion. The track was the site for the fatal crash of three-time world champion Ayrton Senna on 1 May 1994, along with a fatal crash the day before of Austrian Roland Ratzenberger. The track was rebuilt after the tragedies and returned to the calendar in a new guise already the following year. Imola was a happy hunting ground for Emilia-Romagna team Scuderia Ferrari during the era on the re-built track, with Michael Schumacher winning the race five times in front of the home crowd. The most popular sport in Emilia-Romagna is by far football. Several clubs from Emilia-Romagna compete at a high level on the national stage. Bologna, SPAL and Sassuolo compete in the top-flight of Italian football – in Serie A. The region's two biggest clubs are the only two to win major honours: Bologna, which has won seven scudetti and two Coppa Italia trophies, and Serie B side Parma, winners of four European trophies (two Europa Leagues, one Cup Winners' Cup and one Super Cup) and three Coppe Italia. Cesena and Carpi both compete in Serie B. The region has hosted 32 of Italy's 331 home games. With 13 professional clubs in 2013, the region is only bettered in terms of number of professional clubs by Lombardy. It also has 747 amateur clubs, 1,522 football pitches and 75,328 registered players. Included in the table below are all sides in the top three tiers of Italian football (Serie A, Serie B and Lega Pro), as well as any sides that have won major honours. Another popular sport in this region is basketball. Two teams from Emilia-Romagna currently compete in the Lega Basket Serie A: Virtus Bologna, which with 15 scudetti, 2 Euroleague championships and 8 Coppe Italia is one of the most important teams in Europe, and Reggiana from Reggio Emilia. Fortitudo Bologna have also won two scudetti, but currently compete in Serie A2. The region has a very strong tradition in volleyball as well, with three clubs that are among the oldest, most winning and prestigious teams in Italy and Europe: Parma, Modena and Porto Ravenna. These three clubs have won a combined 9 CEV Champions Leagues, 4 won by Modena, 3 by Ravenna and 2 by Parma. There is not another comparable region in Europe with such a big presence of successful volleyball clubs. Another important volleyball club which has achieved important results both in Italy and in Europe during the last 15 years is Copra Volley from Piacenza. Panthers Parma are one of four American football teams that have participated in every edition of the Italian Football League. Zebre compete professionally in the Pro14, the combined Irish, Italian, Scottish, South African and Welsh rugby union league. The club's home ground, the Stadio Sergio Lanfranchi, is located in Parma. Included in the table below are all sides in the top two tiers of Italian rugby. ^ a b "ISTAT - Regional GDP". www.dati.istat.it. Archived from the original on 2018-03-24. Retrieved 2018-01-23. ^ a b Regional GDP per inhabitant in the EU27: GDP per inhabitant in 2005 ranged from 24% of the EU27 average in Nord-Est Romania to 303% in Inner London. European Commission, Eurostat. 12 February 2008. ^ "Qualita' della vita: il dossier". Il Sole 24 ORE. Retrieved 2013-11-28. ^ "Università di Bologna (oldest university in the world)". 44.49658200;11.35316800: Virtual Globetrotting. 2006-10-21. Retrieved 2013-11-28. ^ "UNESCO SITES in Emilia Romagna". UNESCO SITES in Emilia Romagna. Retrieved 13 April 2018. ^ (in Italian) Article Archived April 19, 2016, at the Wayback Machine on "il Resto del Carlino"
^ Colleen Barry (2012-05-30). "Dailystar, 17 dead and 200 injured in latest killer quake in northern Italy". Dailystar.com.lb. Retrieved 2013-11-28. ^ European Commission (2002). "Communication from the Commission to the Council, the European Parliament, the European Economic and Social Committee and the Committee of the Regions, Towards a Thematic Strategy for Soil Protection. Thematic strategy for soil protection COM(2002)179". European Commission, Brussels. ^ "Giunta – E-R Il Portale della Regione Emilia-Romagna". Regione.emilia-romagna.it. Retrieved 2015-08-30. ^ "Museo Nazionale Emigrazione Italiana". Museonazionaleemigrazione.it. Archived from the original on 2011-07-22. Retrieved 2013-11-28. ^ a b c "Eurostat". Circa.europa.eu. Archived from the original on 2009-02-23. Retrieved 2009-03-13. ^ Fiorenza Belussi; G. Gottardi; Enzo Rullani (30 September 2003). The Technological Evolution of Industrial Districts. Springer. p. 348. ISBN 978-1-4020-7555-1. Retrieved 13 April 2012. Wikimedia Commons has media related to Emilia-Romagna. 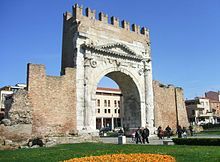 Wikivoyage has a travel guide for Emilia-Romagna.